The world will run out of contestants for The Biggest Loser before it runs out of Yoda cakes. Which–I know–is saying a lot. This porcelain-like, vanilla with strawberry buttercream filling Jedi master comes to us by way of Judy of Frostings by Judy. I made it in August of 2006 for my brother Jacques because he had been away in South Korea teaching English as a Second Language and we hadn’t seen him in over a year. It was a belated surprise birthday party. He’s a big Star Wars fan so that’s why I chose Yoda. 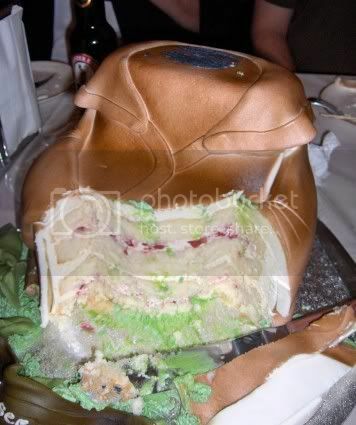 It was covered in fondant, and I airbrushed the clothes. I made the ears on long skewers well ahead of time so that they would dry and inserted them into the cake once I made it to the party destination (an hour and half drive away). It was a nerve wracking drive, trying not to make too many sharp turns in the car so that Yoda’s head wouldn’t fall off. My brother was totally surprised and loved the cake. But until then, I imagine we’ll continue to be plagued by well-intentioned cake artisans and gracious cake recipients. Sigh. Anyway. Thanks for the deets, Judy. Hah! Your comments make the cake! Thanks for the morning laugh! 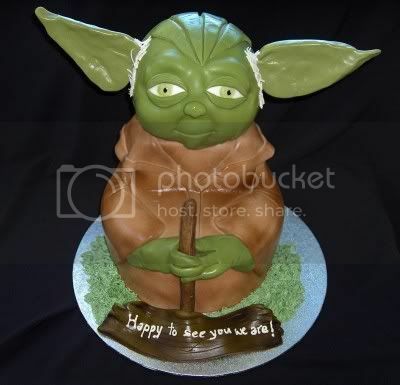 Great cake of Star War Yoda, and it looks superdelicious! Next post: A Vampire Attacked My Geeky Cake of the Week!